সহকারি শিক্ষক পদে নিয়োগ বাংলাদেশ ধান গবেষণা ইনস্টিটিউট উচ্চ বিদ্যালয়ে শিক্ষক নিয়োগ ২০১৯. Applications are invited from the permanent citizens of Bangladesh for the following positions in the Bangladesh Rice Research Institute High School under Bangladesh Rice Research Institute, Joydevpur, Gazipur. Organization Name : Bangladesh Rice Research Institute. Purplish Date : See the circular . 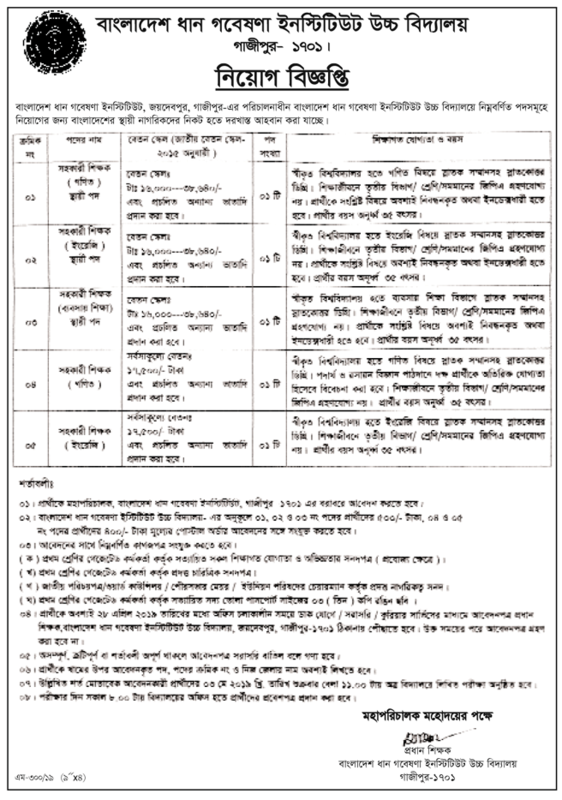 TaggedAppointment of assistant teacher for Bangladesh Rice Research Institute High School. Previous Article Bangladesh Supreme Court job Circular 2019. Next Article Information Department-Bangladesh Information Department Job Circular.